Wedding in India, Watching Live from South America, Anything is Possible. With Time our life style has changed, the way we live, the way we do things and now even weddings. Its not just the Bride & groom, but their Near & Dear one’s who are happier to see them getting married. Blame it on Murphy or work or anything, there are occasions where people meet their closest family/friend’s only during weddings. Earlier, to be precise two decades back the only way they could see this was using the Wedding Cassettes or Wedding Albums which come a month or so after the marriage. Technology has improved so have the gadgets and the people who uses it. We are writing about this scenario to make sure anyone sitting anywhere will be able to watch your wedding without being present physically in the venue. We are living in an era where we can see anything and everything streaming online. This involves a price, a big one, but think about the positive side. 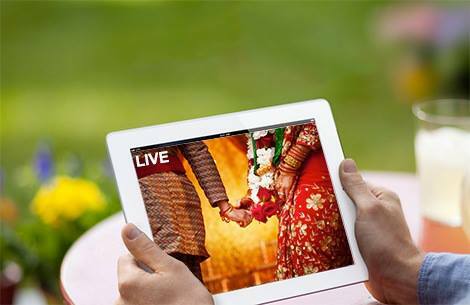 Streaming wedding live online has been used in countries like America since sometime, we have the set up, but we Indians still believe in our physical presence. We are going go throw some light on this subject on a practical note. For Live Streaming a video Online we don’t need a bigger set up also. We need a decent Internet connection, a video camera strategically placed and the right website which streams it online Live. The pricing part becomes zero If we can imagine about the happiness of the person who missed the wedding because of a medical condition, watching it live in the bed from whichever country he/she resides. That is priceless. Another Cheaper way is Live blogging of the wedding using Social Media like twitter, Facebook, Vine, Instagram etc. where you can upload pics and videos real time the very instant you shoot them . We at Theknotstory can help you with this, how to do this, what is the set up you need for this, to meet the right people who can help you do this..
We don’t deal with marriages, we make the weddings happier and better. This entry was posted in The Knot Factory, Wedding / Marriages, Wedding Planning and tagged Indian wedding invite, Livestreamingwedding, livewedding, People, planning, WEdding online. Bookmark the permalink. ← Wedding Gifts 001 – The Brand new Ford Ecosport!